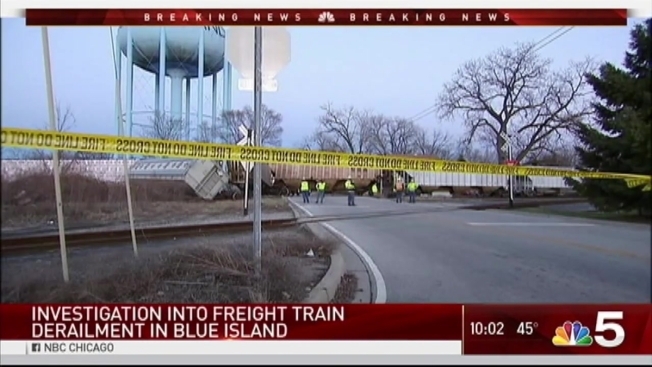 A freight train derailed in south suburban Blue Island during rush hour Tuesday afternoon. Chris Hush reports. An eastbound freight train derailed in south suburban Blue Island during rush hour Tuesday afternoon. Several cars were seen off the tracks and flipped at 135th Street and Chatham. It was not immediately clear what caused the derailment. No one was injured. The three derailed cars were empty and the other cars were carrying mixed freight. "Safety is CSX’s highest priority, and that includes the safety of our employees and the communities where we operate. Our goal is zero accidents, and we work to achieve that goal every day," a spokesman for the rail company said in a statement. "The cause of this incident will be investigated, and any lessons learned through the investigation will be applied to avoid additional, similar events in the future. We apologize for any disruptions this has caused nearby residents." The cleanup process was expected to last into the morning hours of Wednesday, the spokesman said. There were no major traffic disruptions.